· 6-Axis four-helicopter flight gyroscope, strong stability, you can easily implement several flights and wind resistance stronger, easier to control. · Aircraft built in the remote control positioning system, you can automatically locate the current position of the remote control easily return to its place. · 360 degree 3d professional action cool flight subversion and two design .The color of LED light, which can fly freely in the dark night. · The remote control of the camera 90° upwards and the camera down.HD with the constant high pressure system, easy stable and smooth image output, offer gamers a better picture experience. · Main Features: 2000mAh large battery capacity, can support flying time 9 minutes. 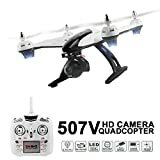 Specifications: Frequency: 2.4GHz Color: White Gyroscope: 6 axis Charging time: About 90 minutes Flight time: About 9 minutes Remote distance: 100-150m Product size: 53 * 53 * 18CM (L * W * H) Package size: 60 * 13 * 35CM (L * W * H) Battery Capacity: 7.4V 2000mAh Lithium Battery Remote Control Battery: 4 * AA battery (NOT INCLUDED) Function: up/down, left/right, right, sideward - No. forward/backage .turn left/right, with gryo/flash lights,3d filp, with key return, High Hold Mode, Headless Mode, video and camera Package listing: 1 * Quadcopter 1 * Remote Control 1 * Charger 4 * Protection Frame 1 * Balance Charge 1 * Battery 4 * Merry Hood 2 * Screwdriver 1 * Card Reader 1 * Memory Card 1 * InstructionWithout order to ensure the product brand new and can work properly, our staff will conduct product testing before shipment, so maybe the color box adhesive tape is opened.